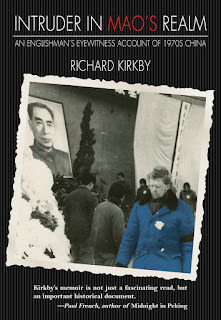 China in the early-to-mid-1970s was more closed and mysterious than is North Korea today, but between 1974 and 1977 Kirkby taught at Nanjing University. From there he witnessed the tumult of Cultural Revolution China first-hand, notwithstanding official efforts to enforce a state of isolation on the tiny group of foreigners in the country. He observed and sometimes participated in the roller-coaster political campaigns, including the first post-1949 mass demonstrations against the Mao order of April 1976. With the deaths of the iconic leaders of the revolution - Zhou Enlai, Zhu De and, in September 1976, of Mao himself - he was caught up in the events which eventually signalled a formal end to the Cultural Revolution - the arrest of the Gang of Four. In 1978 Kirkby moved to Shandong University. China was slowly regaining its balance, and for the first time it was possible to forge semi-normal relationships with acquaintances and colleagues. Why did you want to go to China in the 1970s? My motivations were primarily political with a very small ‘p’. I was always a sceptic about the Cultural Revolution and the Mao project in general and I wanted to see it for myself. Also, I had a family background in which China loomed large - my mother was born there and there were also strong connections on my father’s side. Above all, I wanted to (covertly) investigate the question of urbanisation under Mao, about which I eventually wrote a book, Urbanisation in China, as well as many other studies in the ensuing years. There is an incredible amount of colour and detail in your account. Did you keep a journal throughout your time in China? Anything that moved, I wrote it down! I kept different notebooks on general events and observations, political study sessions, visits to revolutionary committees of factories and communes, a village diary and a factory diary when sent to do real work, and a daily (usually angry) commentary on the official Xinhua Daily News bulletins we received regularly but a few days late. I maintained a record of all letters in and out, and I documented my many meetings with city officials to discuss the urban question. Fortunately, the Shanghai Customs in 1977 were trying to be nice to outsiders because of the disgrace of the ‘Shanghai Mafia’, aka ‘The Gang of Four’. So inspections were perfunctory at the time and my notebooks got out unscathed. To what extent was the China you found when you arrived different from what you had been expecting? This might seem paradoxical, even from the standpoint of a naive Westerner, but in general I expected a truly revolutionary atmosphere in which Party members in particular understood the nature of a poor country’s ‘transition to socialism’. I didn’t anticipate how China’s feudal history would still weigh heavily on the way people thought and acted. While in officialese at the time, the hated Soviet Union was characterised as ‘Soviet Social Imperialism’, I began to think of China’s political formation as ‘Social Feudalism’. In what ways has China changed and not changed from the mid-1970s to now? The most obvious constant is the Party, and the way it relates to the people of China and the world in general. The superficialities of life have changed very dramatically, as have disposable incomes, the vast tourism boom with over 100 million travellers overseas annually from the PRC is one result of that. Given my own special interests, it is the transformations of the urban and rural environments which are the most concrete (!) and immediate to me. People inhabit these new, hectic, heaving environments with apparent equanimity, with remarkable adaptability. Certainly the Chinese have vastly richer lifestyles; as for their mode of governance, it too has shown itself capable of adapting to some but by no means all the new aspirations of the population. What would people back in the 1970s have thought of the China of today? No-one, including myself, could possibly have anticipated the changes in China after 1978. As a constant visitor to China from 1980 to the present day, I have glimpsed all. Remember that the re-invention of China has coincided with and continues to be fed by the latest and most impelling push of globalisation in world history, always remembering that globalisation started at the beginning of the 17th century as far as China goes. Again, no-one could have predicted that China’s ‘modernisation’ would coincide with and be accelerated by the rolling revolutions in information technology. Mao’s China was touted as a model alternative to capitalist democracy by some Western dissidents. Your thoughts on that? Oddly, my views about the desirability of a democratic planned political economy in the West were actually strengthened by my immersion in China. Capitalism, as it matures, irons out and subsumes all pre-existing social formations. China in the 1970s threw what Marx called the ‘birthmarks of the old society’ into sharp perspective for me, and made me realise their strength and their ability to colour the political terrain of the time. On the ideological level, for instance, at Mao’s command in 1965, despite strong Party opposition, the fabulous Beijing city walls were largely demolished. These massive ramparts, had they not fallen victim to Mao’s obsession with ‘erasing the past’, would have made China’s capital the wonder of the world today. His ‘reasoning’ was that by eliminating the manifestations of feudal society you could eradicate its lingering ideological inheritance and march ever more quickly to the bright socialist future. Yet his was obviously feudal thinking. On a daily basis I would see similar instances. Sometimes some Chinese people talk with nostalgia about those Maoist years. Your view? Yes, many do. Among a generation who never lived under him, and some older folks too, the cult of Mao is alive and kicking. It’s my view that his Party’s great achievement was to defeat the twin forces of usury/landlordism and foreign aggression. The state monopoly of foreign trade was an indispensable policy of the early PRC. Yet without the thorough-going land reform of the early 1950s (and despite its unfortunate consequences for a lot of landlords) nothing would have fundamentally changed. What must be understood too is that China’s four decades of ‘economic miracle’ couldn’t have happened without much (but not all) of what went before, between 1949 and 1976. I should mention in particular the First Five-Year Plan (1953-7), an astonishing achievement which laid the foundations for the entire industrial revolution to follow, even up to the present day. If Mao had somehow left the scene in 1956 (before the Anti-Rightist purges), the present nostalgia would be shared by many more, especially the ‘intellectual’ classes and the descendants of small business families, petty traders – all of whom got it in the neck in the endless political campaigns. Having said that, the current fashion for demonising Mao reflects the shallowness of the dominant historical narrative - the winners writing history once again. Its verdicts are far too strident, monochrome, deeply ahistorical. As far as the ordinary folk are concerned, losing Mao’s ‘iron rice bowl’, his 8-hour working day and much more as the planned economy retreated was a tremendous and ill thought-out blow, though one acknowledges that the pace of overall economic growth in the past two decades did help to eclipse the phase of pain. Things have sometimes gone better than expected: the manner of uprooting tens, hundreds of millions from the poor interior and their transfer to the new workshops of the world in the East has been much censured. But take a look at other developing countries and their million-plus squatter settlement misery before you make your judgments on China. Also, on a daily basis, there are now hundreds of minor, often spontaneous rebellions in every corner of the country. The height of the Cultural Revolution apart, before there could be none. Most of today’s eruptions result from clumsy policies, and corruption. Sometimes they have more sinister genesis - the infection of blind market-worship. The tragic episode of the Falun Gong is a case in point: if the medical safety-net hadn’t crumbled, to be replaced by the cash register, I doubt if the FG would have emerged. My judgement is that the government is squarely to blame for much of the ‘chaos’ it always fears – chasing as it does the chimera of neo-economics and remaining deaf in at least one ear to demands for representation. But is it surprising that the powers-that-be have taken this route? After all, not a few of China’s lofty Party families have found happy niches amongst the global financial elite. What are your thoughts on how foreigners fitted into China then, and how they fit in now, based on your experiences? Details: Intruder in Mao’s Realm is published by Earnshaw Books (Hong Kong) Ltd in paperback and eBook, priced in local currencies.